A popular ski resort about six hours away from Denver, this town is a charming historic district, filled with turn-of-the-century houses and a historical museum. Here are the top nine things to do in Telluride. Hands down, the most common reason to visit Telluride is for its amazing ski slopes spread across more than 2,000 acres. 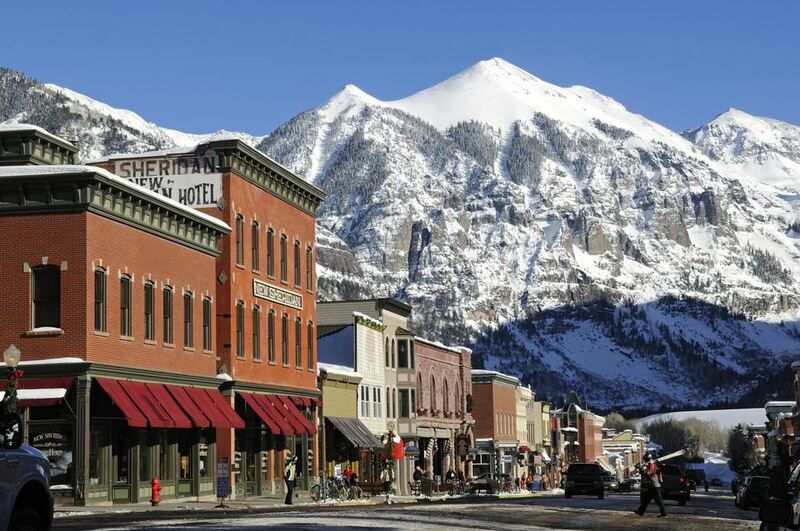 Telluride Ski Resort's combo of high snowfall (more than 300 inches on average annually) and sunny weather makes it a popular place to vacation. Telluride is also a supreme place to go hiking. The San Juan Mountains are stunning year-round, and they hold countless nearby trails that can lead you to a lake, waterfall, creek, and even an old mining area. The San Juan National Forest itself spread out over an impressive 1.8 million acres in southwestern Colorado. In the Telluride region, check out Bear Creek Trail, which is appropriate for all levels and abilities, even newbies. It’s about two miles long, takes about an hour, and will bring you through the preserve to the Upper Bear Creek Falls. Bear Creek Trail is one of Telluride’s busiest trails. If you want to keep going, you can connect to Bridal Veil Basin or the Wasatch Trail. Another recommended hiking trail is the Jud Wiebe Trail if you have a little more experience hiking and want more of a challenge. This trail is rated moderate to difficult, but it’s less than three miles roundtrip. Then there’s the easy Overlook Trail if you’re crunched for time but want to snap some incredible photos. It’s as short as a trail can be (only 0.2 miles), starting at the gondola. Hence the name, follow it for some of the best views overlooking Telluride below. This old Victorian town has a rich history, and you can experience it in different ways. Simply strolling through the historic downtown is the easiest way. Let yourself be inspired by the architecture and turn-of-the-century homes. Then visit the Telluride Historical Museum, where you can learn about the town’s colorful roots in mining, gambling, and prostitution. The museum spans 10 different rooms, each with a different theme and offering interactive displays. It's much more than just looking at old photos. Mountain Village is the heart of the ski resort, perched at about 9,500 feet altitude. It’s a tiny home-rule municipality founded in 1995. Take the free, scenic gondola (open year-round) from the town of Telluride up to Mountain Village, and take in the breathtaking views. The journey to Mountain Village is just as great as being there. Mountain Village is located close to the slopes in the winter, but you can find great shops, restaurants, and more here year-round. It’s also a launching point for all kinds of outdoor adventures, such as biking, a summer concert series, tennis, and fishing. While Telluride is busy with festivals and music, you can take the gondola up to the village and find some relief from all the excitement. The Sunset Concert Series in Mountain Village is a great way to end a summer day in the Telluride area. Mid-June, you can listen to live music every Wednesday at sunset. Throughout the summer, you can catch nine different shows, all free and open to the public. Grab a local craft beer from a nearby restaurant, which you can drink in a special common area while you listen to the jams. This is definitely where you want to be on the Fourth of July, when Mountain Village’s Sunset Plaza features a Red, White, and Blues Celebration with various musical guests, jumpy houses for kids, an ice cream social and other family-friendly activities, like face painting. This is a bucket-list, must-do activity in Colorado. Bridal Veil Falls are the tallest, free-falling waterfalls in the state, plunging a dramatic 365 feet from the mountain. The hike is slightly challenging; it’s rated as moderate, with a 1,650-foot elevation gain. But it’s not too long—just under two miles each way to reach the top. The views are worth all the effort, though. In the winter, the waterfall freezes over and Bridal Veil Falls is used for ice climbing. That's just as impressive and quite an adrenaline rush, if you know how to ice climb. The reputable Telluride Film Festival weekend draws movie buffs and film industry leaders to town every year over Labor Day weekend. One of the coolest things about this festival is it keeps all its films a secret until it opens, and the festival has a knack for picking out the next big film. It has premiered many memorable and popular films over the years since it launched in 1973. In addition to screenings, the event includes various ways to bump elbows with film bigwigs, from discussions to gatherings. The Telluride Film Festival offers more than 50 programs in 10 different locations. If you’ve never hit a golf ball at more than 9,000 feet altitude, head to the beloved Telluride Golf Club. Golfing at such an altitude feels different than at sea level, and it’s something any golf-lover should experience at least once. There’s less resistance on the ball, which typically means your drives go farther; you’ll feel like a superhero. Telluride Ski and Golf offers an 18-hole course with mountain views, open from May through mid-October. Telluride is home to some of Colorado’s biggest and most impressive events, including the annual Telluride Bluegrass Festival. Every June, Telluride attracts music-lovers to hear live bands knock out excellent bluegrass jams and other kinds of folk and roots music. Over the years, the festival has presented big names, including Mumford & Sons, The Decemberists, Elvis Costello, and Ani DiFranco. The festival lasts four days and is much more than just live music. Most people camp, and smaller gatherings and music jams break out throughout the day and night. The festival is intentionally held the weekend closest to the summer solstice, the longest day of the year and the beginning of summer. Bonus: The Telluride Bluegrass Festival is held in the Town Park campground area, a wonderfully scenic area southwest of Telluride. Town Park has picturesque walking paths, a pond, multiple playgrounds, and sports courts—even an outdoor pool. The campground itself is one of the best places to camp with families, festival or not.